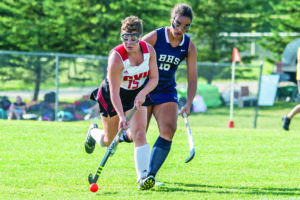 CVU’s Nora Weisman-Rowell gets past Burllington’s Shaneil Gulfield during their field hockey match vs Burlington on Friday in Hinesburg. CVU’s Hailey Chase beats Burlington’s captain, Olivia Gentchos to the ball at Friday’s field hockey match in Hinesburg. CVU’s Lena Ashooh looks to pass during their field hockey match vs Burlington on Friday in Hinesburg. 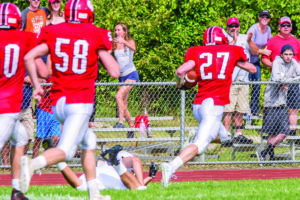 CVU’s Seth Boffa runs out of the last potential tackle on his way to the endzone during CVU’s game vs BFA St Albans on Saturday the 1st. CVU’s Cole Boffa helps make the sure tackle during CVU’s game vs BFA St Albans on Saturday the 1st. 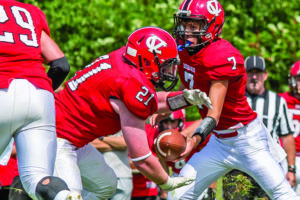 CVU quarterback, Ryan Anderson hands the ball to Shane Boehmcke during CVU’s game vs BFA St Albans on Saturday the 1st. CVU’s Bennett Cheer (63) makes the stop with a little help during CVU’s game vs BFA St Albans on Saturday the 1st. The Champlain Valley Union High School field hockey team started the fall season on the right note. The Redhawks defense did not allow a shot on goal to earn a shutout over Burlington on Friday. Flynn Hall paced the offense in the 6-0 win. Hall had three goals and one assist for CVU (1-0), while Caroline Reynolds, Hailey Chase and Lena Ashooh each tallied once for the home team. Rotha Ibrahim was in net for the Seahorses (0-1) and made nine saves. 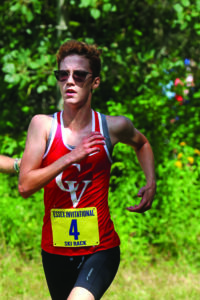 A one-two finish lifted the CVU girls cross country team to a win at the Essex Invitational on Saturday. Alice Larson finished first and Ella Whitman followed in second place to pace the Redhawks. 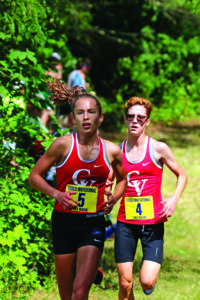 Chloe Andrae came in fourth place and Finnegan Mittelstadt followed in sixth place to round out the finishers in the top 10 for CVU. The CVU boys team finished in fifth place in the team competition, with Essex, U-32, Burlington and Mount Mansfield coming in first through fourth, respectively. Champlain Valley 6, Burr and Burton 0: The CVU boys soccer team hit the road for its first game of the season and came away with at 6-0 win over Burr and Burton on Friday in Manchester. Jack Sinopoli, Nate Sampson, Jonah Roberts, James Schmidt and Sam Johnson all scored for CVU (1-0). Aidan Johnson had one stop to earn the shutout for the Redhawks. 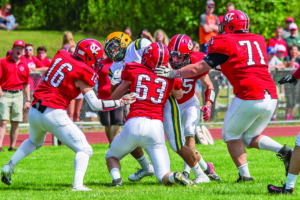 BFA-St. Albans 37, Champlain Valley 6: Seth Boffa was a bright spot for the Champlain Valley football team in a season-opening loss to BFA-St. Albans on Saturday in Hinesburg. Boffa had 76 yards and scored the Redhawks (0-1) only touchdown on a 65-yard run. 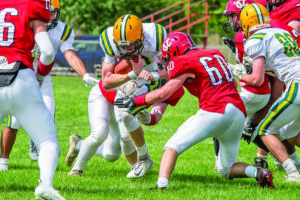 Adam Forbes led the BFA-St. Albans offense with 104 yards on the ground and a touchdown, while Cooper Cioffi, Robert Gamache, Dominic Liscinsky and Nate Loughlin also scored for the Bobwhites (1-0).